Over the past week, there has been widespread surprise inside the AAF at the comments made by controlling owner Tom Dundon about the future of the startup league. From coaches to front office personnel, many in the Alliance have expressed concern about Dundon's negotiating tactics. Moreover, some wondered what his comments meant for the negotiations between the AAF and NFL Players Association over the use of practice squad players. The two sides, led by AAF head of football Bill Polian and NFLPA executive director DeMaurice Smith, have been talking about how best to approach a working relationship. The pair go back a long way and are friendly with one another. The AAF essentially wants to borrow practice squad players to develop them while enhancing the quality of its product and building a working relationship with the NFL. The NFLPA, understandably, has concerns about player protection, though the AAF has offered to fund insurance for players hurt during their time in the Alliance. There are also logistical hurdles regarding a player's futures contract, in which an NFL team claims the rights to players for the following season. While influential people in the NFL like what the AAF offers (one example of this connection is the AAF moving its championship game to the Star in Frisco, owned by Cowboys owner Jerry Jones), player protection and rights are obviously major sticking points that are rarely solved quickly. "If the players union is not going to give us young players, we can't be a development league," Dundon, who in February pledged to incrementally invest $250 million into the AAF, told USA Today. "We are looking at our options, one of which is discontinuing the league." Dundon added that a decision about the future of the league would be decided by the end of the week. He doubled down on that assertion Monday evening in an interview with the Sports Business Journal. Alliance of American Football owner Tom Dundon tells me a decision whether to shutter the 7 week old league could come as soon as tomorrow or days. He wants a development agreement with the NFL/NFLPA, but no evidence they are willing. Story in @sbjsbd. While Dundon's remarks seemed to be a strong arm attempt to move things along, they immediately created doubt about whether the AAF would exist in Week 8 (and now in Week 9). The Week 8 games were played but anything beyond that is no guarantee. In the wake of Dundon's initial comments, Arizona Hotshots coach Rick Neuheisel offered his views -- unsolicited -- on the AAF's future after his team's 23-6 win at San Antonio on Sunday. Neuheisel is an eternal optimist, but his stance left a far better impression about the state of the Alliance. "I'm very hopeful, and have reason to be very hopeful, that the powers that be that are getting to Mr. Dundon, who obviously made a big stake in this thing, and saying 'patience, this is going to be really good.' They come from the NFL and the league office. They come from all the coaches that are enjoying watching this from the NFL side and watching the development of players," Neuheisel said. "And I just think it's really good for football in terms of this opportunity. And think forward. Think about all the opportunities that could be afforded to different coaches whether it's a chance to be a head coach or to call plays for the first time. These are opportunities that may not otherwise be afforded because the stakes are too high to put somebody in that doesn't have experience," he continued. "This is where you get experience. This is an unbelievable tool for the game of football and I know the powers that be close to Mr. Dundon, who obviously is a very successful and brilliant guy, are getting the word to him. Patience. And I think I speak for all the other seven coaches to echo that." Dundon is the one investing the money. As such, he's the one with the power to make these moves. There's what the AAF could be -- a proven developmental league that's partnered with the NFL -- and then there's what the AAF is currently, which is soon to be one of two pro leagues with the XFL coming back in 2020. That risk/reward is what Dundon has to consider. 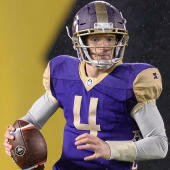 As for the immediate future of the AAF, it would still be surprising if the league folded before the end of its inaugural season. Multiple sources close to the AAF indicated as recently as last weekend that things were business as usual -- but that was also before Dundon's more recent comments. The AAF's future has gone back and forth between feeling secure and tenuous, but Dundon's willingness to speak publicly and candidly means it's only a matter of time before the next adventure. Check out the latest power rankings for the new Alliance of American Football League.